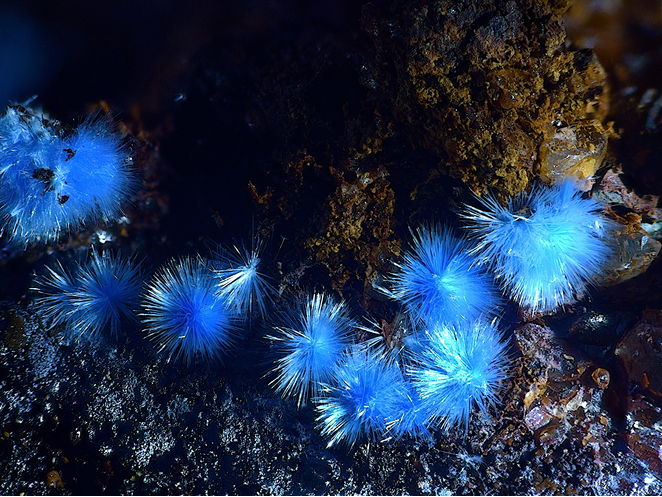 Cyanotrichite: Mineral information, data and localities. From the Greek κυανός for "blue" and θρίξ for "hair" in allusion to its colour and habit. A secondary copper mineral found sparsely in the oxidation zones of copper-bearing ore bodies. Cyanotrichite is closely related to Carbonatecyanotrichite, from which it is impossible to distinguish without XRD measurements (tests for carbonate are not conclusive). Improved powder data are recently given by Hager et al. (2009) who suggest that there is no evidence for a solid solution series between cyanotrichite and carbonate-cyanotrichite; it is also evident that some carbonate-cyanotrichite specimens contain no sulfate. The nomenclature situation is still complicated because the crystal structures of neither mineral is presently known. See also Unnamed (Cyanotrichite-related mineral). A range from 2.737 (Morenci material) to 2.95 (Cap Garonne ?) exists in the literature. Occurs as velvet-, wool- or cotton-like aggregates and coatings comprised of minute acicular crystals; also radial-fibrous or tufted. Cyanotrichite Group A group of closely related, monoclinic Cu-Al-sulphates. Brochantite 131 photos of Cyanotrichite associated with Brochantite on mindat.org. Malachite 68 photos of Cyanotrichite associated with Malachite on mindat.org. Chalcoalumite 47 photos of Cyanotrichite associated with Chalcoalumite on mindat.org. Parnauite 40 photos of Cyanotrichite associated with Parnauite on mindat.org. Azurite 26 photos of Cyanotrichite associated with Azurite on mindat.org. Chalcophyllite 26 photos of Cyanotrichite associated with Chalcophyllite on mindat.org. Grandviewite 20 photos of Cyanotrichite associated with Grandviewite on mindat.org. Spangolite 16 photos of Cyanotrichite associated with Spangolite on mindat.org. Gypsum 11 photos of Cyanotrichite associated with Gypsum on mindat.org. Lavendulan 10 photos of Cyanotrichite associated with Lavendulan on mindat.org. Werner (1808) 62 (as Kupfersammeterz and Kupfersamterz). Jameson, R. (1816) A System of Mineralogy. second edition, 3 volumes: 3: 153 (as Velvet Copper Ore). Breithaupt, A. (1823) Vollständige Characteristik etc. 1st. ed. : 168 (as Sammeterz). Breithaupt, A. (1832) Vollständige Characteristik etc. 2nd. Ed. : 320 (as Sammeterz). Glocker, E.F. (1839) Handbuch der Mineralogie, 2nd. edition, Nürnberg: 587 (as Cyanotrichit). Percy (1850) Philosophical Magazine and Journal of Science: 36: 100 (as Lettsomite). Prior, G.T. (1889) Note on connellite from a new locality. Mineralogical Magazine, vol. 8, n° 39, 182 (referring to 'namaqualite' from Namaqualand). Palache, C., Berman, H., & Frondel, C. (1951) The System of Mineralogy of James Dwight Dana and Edward Salisbury Dana, Yale University 1837-1892, Volume II. John Wiley and Sons, Inc., New York, 7th edition, revised and enlarged, 1124 pp. : 578-579. Acta Univ. Carol., Prague, Geol. (1965) 149-155. Gröbner, J. (1997) Mineralien der Cyanotrichit-Gruppe aus Fundorten in Österreich. - Mineralien-Welt 8 (3), 27-30. (in German). Hager, S. L., Leverett, P. & Williams, P. A. (2009) Possible structural and chemical relationships in the cyanotrichite group. Canadian Mineralogist 47, 635-648. Mills, S.J., Christy, A.G., Schnyder, C., Favreau, G., Price, J.R. (2014) The crystal structure of camerolaite and structural variation in the cyanotrichite family of merotypes. Mineralogical Magazine, 78, 1527–1552. Mills, S.J., Christy, A.G., Colombo, F. & Price, J.R. (2015) The crystal structure of cyanotrichite. Mineralogical Magazine, 79(2), 321–335. Mills, S.J., Christy, A.G. & Favreau, G. (2017) Multidimensional structural variation in the cyanotrichite family of merotypes. 24th Congress & General Assembly of the International Union of Crystallography, Hyderabad, India. 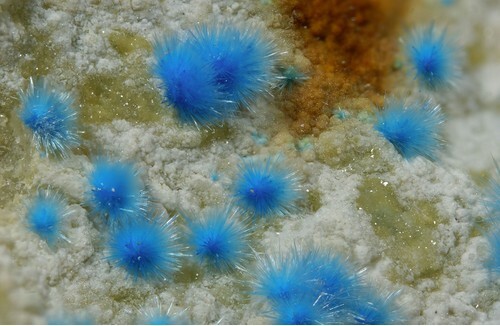 The following Cyanotrichite specimens are currently listed for sale on minfind.com. Brandstätter, F., Niedermayr, G. & Walter, F. (2010): 1641) Neue Funde von Brochantit, Chalkopyrit, Cyanotrichit und Malachit sowie anderer Mineralien aus dem Bereich Totenkopf – Hohe Riffl im Stubachtal, Salzburg. Pp. 229 in Niedermayr et al. (2010): Neue Mineralfunde aus Österreich LIX. Carinthia II, 200./120., 199-260.; Kolitsch, U., Brandstätter, F., Niedermayr, G. & Walter, F. (2012): 1749) Carbonatcyanotrichit („Cyanotrichit“) und Djurleit aus dem Bereich des Totenkopfes im Stubachtal, Salzburg. P. 153 in Niedermayr, G. et al. (2012): Neue Mineralfunde aus Österreich LXI. Carinthia II, 202./122., 123-180. Seemann, R. (1993): Geolehrpfad Knappenwand Untersulzbachtal. Naturkundlicher Führer zum Nationalpark Hohe Tauern, Band 10, Österreichischer Alpenverein, Innsbruck, Austria, 115 pp. ; Lewandowski, K., Lerch, H. & Seemann, R. (2006): Chronik - Schaubergwerk Hochfeld "Bergbau im Untersulzbachtal – Eine fast vergessene Welt" Die 500-jährige Geschichte des Kupferbergbaus am Hochfeld im Untersulzbachtal. Zukunftskollegium Nationalpark Hohe Tauern, Neukirchen a. G., 288 pp. A. Strasser: Die Minerale Salzburgs (1989); Seemann, R. and Brandstätter, F. (1987): Altaitführende Erzparagenesen aus dem Blauwandlstollen, Untersulzbachtal, Salzburg. Ann. Naturhistor. Mus. Wien 89A, 1-13. Seemann, R. (1993): Geolehrpfad Knappenwand Untersulzbachtal. Naturkundlicher Führer zum Nationalpark Hohe Tauern, Band 10, Österreichischer Alpenverein, Innsbruck, Austria, 115 pp. 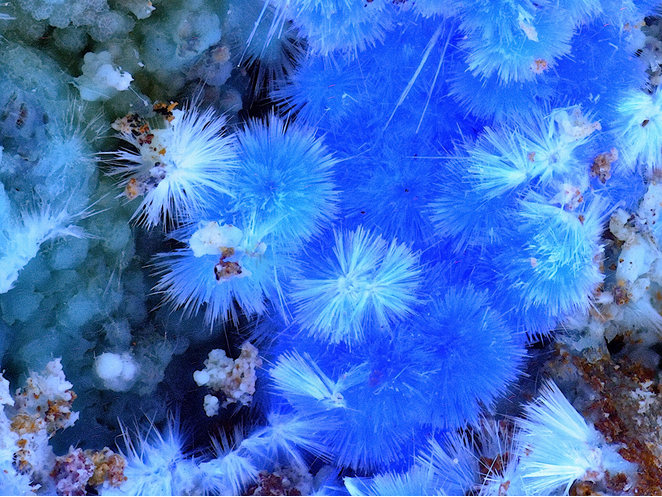 Meixner, H. (1976): New mineral finds from Austria. XXVI. Carinthia 2, 86, 11-42; A. Strasser: Die Minerale Salzburgs, 1989; - Strasser, A. (2010): Mineralneufunde. Mineral. Arch. Salzb. 13, 277-285. Kolitsch, U. (2010): 1664) Azurit, Brochantit, Carbonatcyanotrichit, Cyanotrichit, Jarosit, Ludjibait, Malachit, Pseudomalachit und weitere Mineralien vom Quarzitsteinbruch bei Falkenstein, Fischbach, Fischbacher Alpen, Steiermark. Pp. 248-250 in Niedermayr et al. (2010): Neue Mineralfunde aus Österreich LIX. Carinthia II, 200./120., 199-260. J. Gröbner: Weitere Funde von Cyanotrichit in Österreich. MINERALIEN-WELT 16 (3/2005), 60-62. Jambor, J. L. (1960). Vanadium-bearing interlava sediment from the Campbell River area, British Columbia (Master thesis, University of British Columbia). Palache, C., Berman, H., & Frondel, C. (1951), The System of Mineralogy of James Dwight Dana and Edward Salisbury Dana, Yale University 1837-1892, Volume II: 579; UKJMM 2:11-15 "Cap Gronne Secondary Copper and Lead - W.R. van den Berg". CLAUDE Jean-Marie : trouvaille (08/1980) in collection personnelle. K. Walenta: "Die Mineralien des Schwarzwaldes", Weise (Munich), 1992; Kolitsch, U. & Götzinger, M. (2000): Einige Neufunde aus der Grube Clara im mittleren Schwarzwald: Eulytin, Namibit, Volborthit, Gearksutit, Spertiniit, Monazit- (La), Protasit, Sainfeldit, Cyanotrichit und Vauquelinit. - Erzgräber 14, 33-47 (in German); U. Kolitsch, G. Blaß, H.-W. Graf und J. Gröbner (2004): Neufunde aus der Grube Clara im mittleren Schwarzwald. Lapis 29 (2) 18-23; 50. (in German); KRINGS, G. & I. (2000): Cyanotrichit: Erstfund für die Grube Clara. Lapis 25 (12), 43. Wendel, W. (2000): Lavrion-News 2000. Lapis 25 (10), 45-47.; J. Gröbner und U. Kolitsch (2002): Neufunde von Laurion aus den Jahren 2001 und 2002. Aufschluss 53 (5-6), 363-371. ; Rieck, B., Kolitsch, U., Voudouris, P., Giester, G. and Tzeferis, P. (2018): Weitere Neufunde aus Lavrion, Griechenland. Mineralien-Welt 29 (5), 32-77 (in German). ⓘ Petit Monde Tunnel ? Sylvano IOB Collection; Bortolozzi, G.M., Bracco, R., De Tuoni, F., Vidus, L., Bittarello, E., Marengo, A., Ciriotti, M.E., Zorzi, F. (2018) Antiche miniere e affioramenti metalliferi a Comeglians (Val Degano, Friuli-Venezia Giulia): recenti ritrovamenti. Micro, 16, 1-2018, 2-36. Orlandi, P., & Campostrini, I., 2006. Boarezzo. I minerali della ricerca mineraria "Pradisci". Rivista Mineralogica Italiana, 30 (1), 14-24. Palache, C., Berman, H., & Frondel, C. (1951), The System of Mineralogy of James Dwight Dana and Edward Salisbury Dana, Yale University 1837-1892, Volume II: 579; Gruppo Mineralogico Lombardo, (10), 1-54. Chukhrov (1945) Comptes rendus de l’académie des sciences de l’U.R.S.S., n.s. : 45: 370; Palache, C., Berman, H., & Frondel, C. (1951), The System of Mineralogy of James Dwight Dana and Edward Salisbury Dana, Yale University 1837-1892, Volume II: 593. Palache, C., Berman, H., & Frondel, C. (1951), The System of Mineralogy of James Dwight Dana and Edward Salisbury Dana, Yale University 1837-1892, Volume II: 579. Palache, C., Berman, H., & Frondel, C. (1951), The System of Mineralogy of James Dwight Dana and Edward Salisbury Dana, Yale University 1837-1892, Volume II: 579; Lapis 11 (1993), 7. Geologiya SSSR. Poleznye iskopaemye (The geology of USSR. Commercial mineral)- Nedra (Moscou), 1974, vol. VIII, 205 p.
Sumin, N. G. (1941): Cyanotrichite from Mednorudiansk and Kounrad deposits. Acad. Sci. URSS, B., Ser. Geol.. 6, 77-84. (in Russian with English summary); Palache, C., Berman, H., & Frondel, C. (1951), The System of Mineralogy of James Dwight Dana and Edward Salisbury Dana, Yale University 1837-1892, Volume II: 579. Yakhontova, L. K.; Lebedev, V. L.; Guseinov, M. A.; Sokolova, E. V.; Nesterovich, L. G. (1988): Copper sulfates from the low-temperature supergene zone of the Udokan deposit. Vestn. Mosk. Univ., Ser. 4: Geol., (5), 38-43 (in Russian). Čech, F., Láznička, P. (1965): Cyanotrichit z ložiska měděných rud od Lubietové. Acta Univ. Carol., Geol., 3, 149-155. Palache, C., Berman, H., & Frondel, C. (1951), The System of Mineralogy of James Dwight Dana and Edward Salisbury Dana, Yale University 1837-1892, Volume II: 579; Mason, B. (1961): The identity of namaqualite with cyanotrichite. Mineralogical Magazine 32, 737-738. Stalder, H. A., Wagner, A., Graeser, S. and Stuker, P. (1998): Mineralienlexikon der Schweiz. Wepf (Basel), p. 127+155. Stalder, H. A., Wagner, A., Graeser, S. and Stuker, P. (1998): Mineralienlexikon der Schweiz. Wepf (Basel), p. 128. Camm, G.S., Merry, M. (1991) Bayldonite and its associates from Penberthy Croft, Cornwall. UK Journal of Mines & Minerals, 9, 6-15. Anthony, J.W., et al (1995), Mineralogy of Arizona, 3rd.ed. : 198, 376. Anthony, J.W., et al (1995), Mineralogy of Arizona, 3rd. ed. : 146, 198; Leicht, W.C. (1971), Minerals of the Grandview mine, Min.Rec. : 2: 214-221; Rogers, A.F. (1922), The optical properties and morphology of bisbeeite, Am.Min. : 7: 153-154; Gordon, S.G. (1923), Recently described 'bisbeeite' from the Grand Canyon is cyanotrichite, Am.Min. : 8: 92-93; Galbraith, F.W. & D.J. Brennan (1959), Minerals of AZ: 65. Anthony, J.W., et al (1995), Mineralogy of Arizona, 3rd.ed. : 198; Genth, F.A. (1890), Contributions to Mineralogy, Amer. Jour. Sci,. 40: 114. Anthony, J.W., et al (1995), Mineralogy of Arizona, 3rd.ed. : 115, 198. Anthony, J.W., et al (1995), Mineralogy of Arizona, 3rd.ed. : 147. Murdoch, Joseph & Robert W. Webb (1966), Minerals of California, Centennial Volume (1866-1966): California Division Mines & Geology Bulletin 189: 166.
ⓘ Red Metals Mine (North View Copper Mine; Porcupine tunnel; Wheeler tunnel; Revelation patent; Red Metal Mine; NBMG sample sites No. 3333 & No. 4122) ? Dana 6:1092; Palache, C., Berman, H., & Frondel, C. (1951), The System of Mineralogy of James Dwight Dana and Edward Salisbury Dana, Yale University 1837-1892, Volume II: 579.